The complete audio of NTR Kathanayakudu and NTR Mahanayakudu is finally out in the open. Composed by Keeravani, let’s now see how these albums turn out to be. Analysis: The album starts off with the song Kathanayaka. Sung by the super talented Kailash Kher, this number is an instant hit as it takes you into the life of NTR as an actor. Post Baahubali, Keeravani has made sure that his songs have terrific orchestration. Same is the case with this song as well which has an old-school charm. Lyrics by Shiva Datta and Ramakrishna showcase the various roles that NTR portrayed as an actor. The ‘RaRi RaRe’ byline which comes in Kailash’s voice gives you a goosebumps effect. The more you listen to the song, it becomes addictive. With superb visuals on screen, this song will be a rage after the release. Analysis: Analysis The second song is a sad number Venditera Dora which is filled with pathos. The poor and needy are requesting NTR to help them and are sharing their serious problems through this song. Keeravani himself sings this number which is filled with a lot of pain and all this is transformed through moving lyrics. This song is set to come at a crucial point in time and is said to move everyone. Analysis: The third song in the album is Bantureti Koluvu which is once again a meaningful number which moves the narrative forward. Sung by the legendary Chitra and Srinidhi, this song is a full-on traditional number which is based on moments of life. The composition is full of art and has the Indian classical touch. Once again, lyrics by Sirivennela take center stage and make this song situational. Analysis: The last song in NTR Kathanayakudu is Kathanayaka which is a chorus number of the first song. This song is more of extra rendition as Ramya Behera’s voice adds that simple flavor to the song which will be used in the proceedings in a special way. Analysis: The first song in the second part of the NTR Mahanayakudu is Ramanna Katha. This song depicts the greatness of NTR and what he has done for the people of Andhra. It’s a simple number with basic beats and neat singing. Sunita’s voice makes things interesting as the flavor has been kept rooted by Keeravani. There is no experimentation as he brings in the bygone era in an impressive manner. Analysis: Next in line is Chaitanya Radham. The song is all about NTR taking the next steps in politics. The preference has been given to the lyrics which are mostly chorus oriented. The word ‘Anna’ as NTR was fondly called is historically used in this number which has a revolutionary feel. Keeravani has played it to the galleries with this song and once you watch the visuals, this song will be an even bigger hit. Analysis: The last single in the film is Rajarshi. Keeravani goes a step high with his composition and gives the music which elevates the greatness of NTR. The lyrics are just mesmerizing and depict the helplessness of the people and how NTR is going to change all of that in his political journey. Keeravani’s singing adds a special zest to the song which has been terrifically composed by the master musician himself. The lyrics are universal and the way the orchestra and chorus have been designed will surely give a memorable experience to the audience in the theaters. 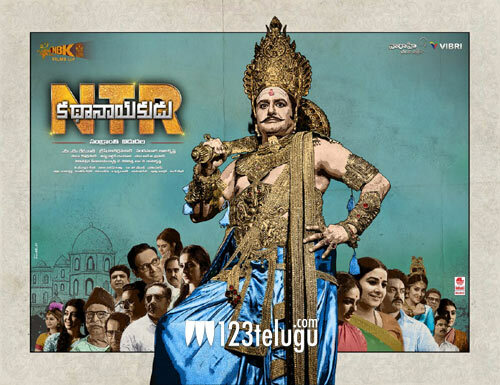 On the whole, there are seven songs in NTR biopic which is being made in two parts. The songs have been composed with a lot of dedication and sincerity. Each song has a special meaning and brings a special change in the proceedings of the film. There was no better person than Keeravani to compose this album and he has given the fans and general audience a reason to get mesmerized through this situational and touching album. Kathanayaka, Rajashri, and Chaitanya Radham are our picks and will be super hits in the coming days. Rest of the songs move the story forward and take you into the world of the legendary NTR.